If you have just had a child or are expecting one, you must have at least once wondered what color your child’s eyes would be. Whose eyes will your baby inherit - mother or father? Well, you don’t have to wonder about it anymore. Our baby eye color calculator will give you a hint about what color eyes will soon be gazing at you. Try it out below! Which Genes Will Your Baby Inherit? Eye color is a physical trait determined by the pairing of genes from both the parents. The baby inherits 50% of eye color genetics material from each of its parents. Genes mutate to give alternative forms called alleles, and each allele slightly differs from the other. There are three pairs of alleles responsible for eye color with each allele giving either brown, green or blue. The brown allele is dominant over green and blue; green is dominant over blue and blue is recessive. The newborn's eye color depends on both the parents' eye color and whether the alleles are dominant or recessive. The child may get two dominant alleles from the parents, one dominant one recessive or two recessive alleles. The child will have brown eyes if it receives a recessive allele (blue) from one parent and a dominant allele (brown) from the other parent. Baby blue eyes depends if it receives blue alleles from both the parents. Since blue is recessive and there is no dominant allele, the child will have blue eyes. The child will have green eyes if it receives green alleles from both the parents or one green and one blue allele. Most of the babies born with blue eyes because the newborns take time for producing the pigment melanin.You cannot determine the exact color of the baby’s eyes until he or she turns three. Human beings have two copies of every gene. One is inherited from the mother, and the other from the father. Homozygous means that two copies match or are dominant (denoted by two capital letters such BB) and heterozygous means that the two copies of the gene differ or recessive (denoted by two small letters, bb). Brown and green are dominant eye colors. 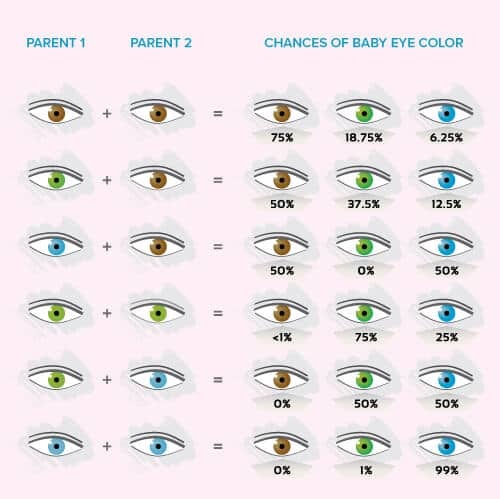 There is 75 to 95% chance of the baby getting brown or green eyes if both the parents have same colored eyes. Blue is a recessive eye color. It’s highly unlikely for a baby to have blue eyes if both the parents have brown eyes. The genotype is the gene combination for a given trait, which, in this case, is the eye color. The mother and father’s genotype will determine the eye color of the children. The phenotype is the physical appearance of the genotype, which in this case is the eye color. Will Your Baby’s Eyes Stay Blue? Most of the new born babies have blue eyes, which may change color over time. The eyes remain blue if both the parents pass their recessive blue genes to the child. If this is not the case, the baby's eye color changes to permanent color (brown, green or any other color) as he/she ages. At the time of birth, there is a deficit of melanin pigment, but with time the iris starts producing melanin to give the eyes their actual color. It takes about six months to one year for the baby's actual eye color to surface. Most babies of Caucasian origin have dark blue eyes when born. However, the original color, be it brown, green, blue or hazel, will be determined over time. The child will get the actual eye color with exposure to light, and it depends on the amount and diffraction of light. Likewise, Asian and African origin babies have brown or dark gray at the time of birth. They turn black or real brown over time. During birth, the infant eye color is light, since new born babies do not have active melanin which darkens the cells. Once your baby is 6months old, the eye color begins to change. Gradually, the eye color takes on a different shade as per the genetic inheritance. Such change starts around the age of six months. By the age of three, kids have a definite eye color, which does not change further. If both the parents have blue eyes, there are 99% chances that the baby will have blue eyes. If both the parents have brown eyes, there are 75% chances that the baby will have brown eyes. If both the parents have green eyes, there are 99% chances that the baby will also have green eyes. If both the parents have hazel eyes, there are 99% chances that the baby will also have hazel eyes. The hazel eyes are still a mystery. The baby eye color calculator cannot accurately predict the likelihood of your child having hazel eyes, as this eye color is often a mixture of brown, green and amber hues. Q. What Is Baby Eye Color Calculator? A baby eye color calculator is an online calculator that can help parents predict the eye color of their children. It tells the likelihood of the baby’s eye color on the basis of eye color genetics using color of the parents’ eyes. Q. How Accurate Are These Baby Eye Calculators? Baby eye calculators are not entirely accurate as genes contribute to the eye color. Also, they do not explain hazel and other shades of brown. So we’d suggest you not to depend entirely on the calculator. Q. What is Waardenburg Syndrome? There are cases when babies are born with one eye as brown and another eye as blue. It is because of a medical condition called Waardenburg syndrome. However, this is a rare genetic disorder. In such cases, it is essential that you consult an ophthalmologist. Studies are going on to find accurate reasons behind the changes in eye color of a newborn. Heterochromia is a genetic or acquired eye condition that affects iris. The baby with this condition ends up having two eye colors i.e. having eyes with different colors. In complete heterochromia, each iris has a different color. Mostly, one is blue and the other brown. Sectoral (partial) heterochromia is where only a portion of iris has a different color. Central heterochromia is when the inner ring has a different color from the outer ring. Genetic heterochromia is an autosomal dominant condition. The child has about 50% chance of inheriting the condition and a 50% chance of passing it to their offspring. The causes of acquired heterochromia include glaucoma, inflammation, Waardenburg syndrome, neurofibromatosis, injury, and illnesses. Most of the cases are benign and congenital. There is no treatment for heterochromia if it is genetic. But if it is due to an underlying condition (acquired), that condition needs to be treated. Some cases of acquired heterochromia may even shorten the lifespan. Our baby eye calculator is only for personal use and should be considered only as a guide. Do not base your medical and other decisions on results of this calculator. Although we have tested the calculator, we cannot guarantee its result. We hope our article helps you determine the color of your baby’s eyes. Do let us know if our calculator worked.